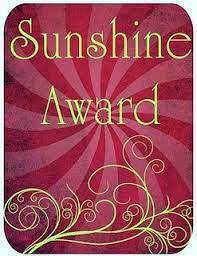 Yesterday I got a lovely message from Kirstan of Getting On Top to say she has nominated me for the Sunshine Award. My first ever blog award – how exciting and made all the more flattering that the award is for bloggers who inspire in a positive and creative way. I’m delighted that Kirstan and others have enjoyed reading my blog and am very chuffed to receive this award! I first discovered Kirstan’s blog through WordPress’s Freshly Pressed series. The post that led me to her blog is this one. Once you read it you’ll know why I followed her right away and why you ought to as well! 1. I love to sing in the shower when I’m at home, the louder the better. It makes me a little sad that the walls of my new flat are so thin and I don’t have a shower radio…YET. 2) When I was 13 I fell in love with Taylor Hanson and began a roughly 2 year campaign to persuade my parents to relocate to Tulsa, Oklahoma. I don’t remember why my campaign ended but I remember feeling particularly peeved years later when I discovered they all married fans who they spotted in the audience at their concerts. That could have been me! 3) When I was wee I wanted to be a hairdresser. When I was at University I cut off all my hair and dyed the remainder jet black. I was quite the sight to behold. In spite of this not one but FIVE friends subsequently allowed me to cut / dye their hair. 4) I’m fortunate to have family in the most beautiful place on Earth, the Faroe Islands and hope to visit them once I can save enough money. I’d like to make a film there in the future. 5) I really enjoy mixing curry powder with ketchup. This tastes incredible with chips (fries) and sausages and takes me back to my time abroad, eating Currywurst in Herbert Groenemeyer’s favourite sausage stall. 6) I like my own time and space but I hate to be lonely. 7) I make no apologies for watching TLC shows like Extreme Cheapskates, Extreme Couponing and Alaskan Women Looking For Love OBSESSIVELY. 8) Along with a DIY haircut that horrified my parents I also used to sport quite a number of piercings with 2 in my arm – these ended horribly – 1 in my nose and 1 in my lip, among others. Sometimes I re-pierce my lip and nose because I miss them, occasionally because it drives my mum nuts. By her nature she will worry about me anyway, right? Better to worry about a couple of irrelevant things over anything bigger! 9) I once hitchhiked from Glasgow to Amsterdam for a charity race. It was good craic – thankfully I wasn’t doing it on my own! 10) I’ve been told I’m a good person to have around in a crisis. I suppose this is relatively subjective and crisis-dependent but I’ll take it all the same. Thank you for the lovely comment about my blog, I never knew that was how we “met”. I hope many more blogging awards come your way, because you have a fantastic blog.